The NFL competition committee released 16 proposed rule changes for next season, which owners will have the chance to vote on next week at their meetings in Phoenix. While some of the rules — proposed by both the committee and NFL teams — are more likely to be passed than others, it will take 24 of the 32 NFL team owners to approve any of the proposed rule changes and implement them for next season. One of the proposed changes will attempt to fix one of the most controversial no-calls of last season — one that left an entire fan base up in arms. The New Orleans Saints found themselves on the wrong end of a no-call during their NFC championship game against the Los Angeles Rams last season — one that left their fans rightfully furious. 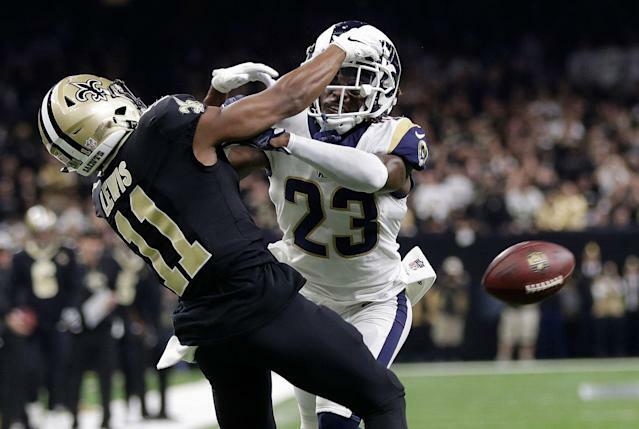 Rams cornerback Nickell Robey-Coleman drilled Saints receiver Tommylee Lewis on a critical third down late in the game, which everybody — even Robey-Coleman — believes warranted a pass interference call. That call never came. The competition committee has a plan to fix that — or at least attempt to fix that. One of the rule changes that the committee proposed would expand reviewable plays in instant replay to include fouls for pass interference — something that is not currently allowed to be reviewed. It would also expand automatic replays to include all scoring plays, turnovers negated by a foul and any extra point and two-point conversion attempt. Had that rule been in place during the NFC title game, the Saints likely would have earned a foul call on that controversial play — which would have likely paved them a path to reach the Super Bowl. The key to this proposal, however, is that it will be in place for onlycone year if it is approved. If it ends up being successful, though, then it’s certainly something that could be put in place long-term. The Kansas City Chiefs proposed a significant rule change for how overtime is played both in the preseason and the regular season. Under the proposed rule change, both teams would be allowed to possess the ball at least once in overtime, even if the first team with the ball scores a touchdown — which, under the current system, ends the game. The Chiefs also want to eliminate overtime for all preseason games and eliminate the overtime coin toss, instead awarding the winner of the initial coin toss the first choice to start the overtime period. While eliminating overtime for preseason games may seem like a no-brainer — as it would help cut down on injuries and other issues in the preseason, when games don’t have any impact on team’s records — the other two changes could be more difficult to pass. The remaining proposals not mentioned above are all from the competition committee, unless otherwise noted. To make kickoff rule changes implemented in the 2018 season permanent. To expand protection for a defenseless player, which would add protection and make a blindside block a foul. To change the enforcement of double fouls when there is a change of possession. To simplify application of scrimmage kick rules for missed field goals. To allow teams to elect to enforce on the succeeding try or on the succeeding free kick an opponent’s personal or unsportsmanlike conduct foul committed during a touchdown. To allow league personnel to disqualify for both flagrant football and non-football acts.